Looks real nice Michael. Using alcohol on the epoxy is fine if you let it cure sufficiently. It can make a mess of things if you don't. I'e never had any issues doing this after 24 hours. IN cold weather it might be a bit longer, but once cured, the epoxy can take wipe downs just fine. Looking forward to starting to see the zip come together. I know it's been a long road for you getting to this point. It'll be another nice feather in your cap when finished though. Slowly transitioning into the next phase of the build. Frames 2, 4 and 5-1/2 are all screwed to the construction form. I was very pleased with the centerline alignment of the stem. You can't really tell from the photo, but it was dead-on. Soon I'll epoxy it into place. Currently prepping the inside of the transom for partial encapsulation & primer coat. In the photo, you can also see my 3/4 laminated keel laying in the floor & awaiting placement. yes you are! Looks great. Really nice work so far Mike. The extra effort on the frames is showing. Of course, now that you say that... I've decided to hold off on that encapsulating & primer work on the transom for now. I set the transom on the form last night, took a few measurements and centered it just to see how it would look. I couldn't resist going ahead and screwing it to the form. The board I'd bought for the breasthook support was not long enough to attach to the other sets of legs. Not sure what I was thinking there. I had attached it to the front set of legs, but found the extended board could easily get kicked out of alignment. So, I took another scrap board I had on-hand & attached it firmly to the back 2 sets of legs, and gusseted it to the "skinny" board. That worked. Hopefully, I'll get the stem glued on this weekend. Looking great, form looks sturdy! Got the stem attached today. I added a little extra blocking. It should be a pretty solid joint. Since I had some epoxy mixed anyway, I went ahead and did a little encapsulation on the transom, too. You might think about a chine block. It looks like the zip chines come in at a pretty flat angle. Nice work Mike. I remember agonizing over my stem and frame 6 for weeks, before finally just taking the plunge and gluing it up. You've done a fine job there. So is the excitement building? mrintense wrote: So is the excitement building? It is. Doing this the second time around is nice, because I know what to expect. Of course, as you know, the excitement of "accomplishing" one task quickly gives way to the reality that it was merely prep work for the next. 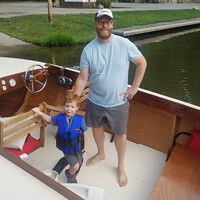 Thank God boatbuilding is really a labor of love! Today, while coating the inside of my garage in red sawdust, I also managed to cut some 2" x 1/2" strips for the chine lamination. Two are 6 feet long, and the other two are roughly 3-1/2 feet. Given their lengths, I won't be able to make one full-length chine, because it would require two scarf joints, with one unavoidably in a sharp bend. However, at least these are ready to be used with future pieces. I also trimmed the keel, leaving myself a little extra at the back just in case. I clamped the forward end into place, and was extremely happy that the curvature of the bend matched the stem almost exactly. Looks great, Micheal! Everything looks very precise from here. Hahaha... my two slow me down plenty. That's okay, though. I don't want my time with them to go by any faster than it has to. If it looks I've made and quick progress on my build, it's merely an illusion. It all went together on the form quickly, just because all the frames had already been long-built. I built the stem in 2013, and spent a year from 2016-2017 just on Frame #2, working at a snail's pace. My latest progress is that I've drilled holes in the keel and the transom knee, in preparation for attaching the keel. The motor board on my transom apparently is thinner at the top than at the bottom, leaving an 8" tapered gap between it and the transom knee. I made a wedge-shaped shim that tapers from about 1/8" to 0" to remedy that. The epoxy is curing on it right now. Michael, I have stuff like that all over my boat! Epoxy and bilge paint cover a multitude of sins.